It's the end of the day as we all made our way to the subway station to get home. My station is the starting station of Line 1 which means that we get to board an empty train. Empty train means available seats and so the moment the door opens, I am very amused to see people fighting their way in as if someone accidentally dropped a grenade on the floor behind them. In all fairness, the subway network spans very a large geographical area, compared to Singapore, and so it may be a relatively long ride. 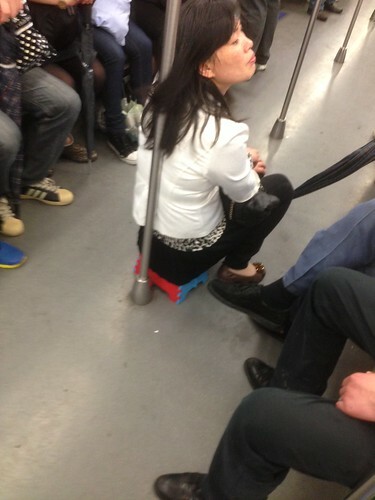 So there I was getting into the train where all the seats were taken, then I saw this lady who brought her own seat. But due to the height, or rather the lack of height, of the stool, I felt that her sitting down was at a very awkward height. I made it a point to stand behind her (how else to sneak a photo?). Sekali I stand in front then the train jam brake and Genghis Khan langah her face how? Better to have a pole in between us. Arrenn: Well, I applaud her for her ingenuity. Heh.